It's time again for our Once a Year Sale. We'll have reductions of up to 75% throughout the store. We'll have a link to a coupon at the end of this blog for an additional 10% off your entire purchase! This year we've combined the sale to not only include our Garden & Home store, but our Table & Pantry store as well. In our Garden & Home store we have handmade Italian table lamps from Vietri that are 25% off. 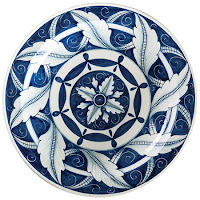 All our blue & white Italian pottery and wall decor from Vietri is reduced 50%. There are specials on some of our other Italian pottery, too. We're offering all our metal wall art at 25% off. There are also a few select pieces for fans of Julia Knight. We never have Julia's pieces on sale, but this year we've decided to offer special pricing on a some designs that Julia has decided to retire. In our Table & Pantry store there's special pricing on French linens from Le Jacquard Francais and Garnier-Thiebaut. We'll be featuring a special offering on Juliska, Match, Vietri, and Arte Italica Dinnerware, including special orders. All Atticus servingware is reduced, with savings as much as 50%. There are wonderful wooden salad bowls, servers, cheese boards and the like. All GG Collection is marked down as well. Now's the time to fill-in with all those pieces you've been waiting to buy. There are specially priced items on our web site and lots of other items throughout the store. Our web items will get updated daily so check back. In addition, click here for a coupon worth an additional 10% off your entire purchase.